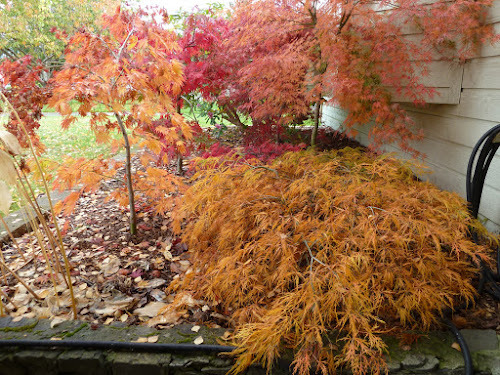 I have had these Japanese Maples for many, many years. They were in the back yard. They had die back every year and in the fall, the leaves would turn brown and fall off. I never really saw very much colour. They barely survived to autumn. 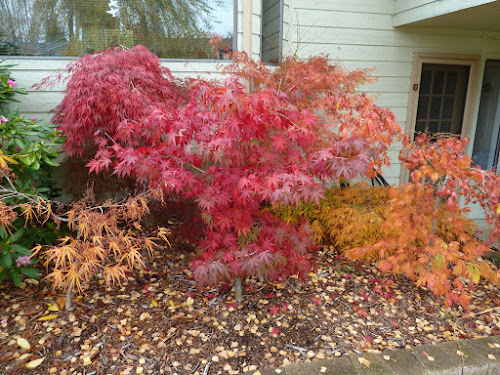 I didn't realize that Japanese Maples hate south sun. I thought all Maples loved full sun. I moved them all to the front garden. It was a big job....but...worth it. I watched them turn the most amazing colours this year. I would sit in the Ugly Chair and just admire the colour. Reminding me of Ontario in the fall....which is exactly why I planted them. It did not once occur to me to take a picture. Until today. So they have faded a bit...and some leaves have fallen, but they are still quite lovely. The second photo is the maple still in the back yard. 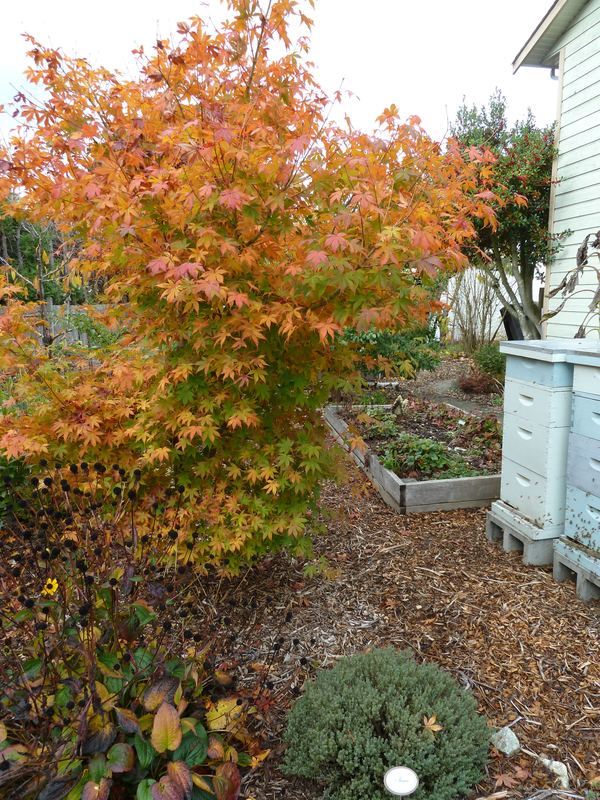 It is surrounded by Back to Eden garden and doubled in size this year after die back every year for about five years. I love gardening. Lovely! Our fruit trees have coloured leaves this year too! Usually they are still green when it snows and they eventually crumble and drop off, but this year they are changing colour and it is lovely. No gorgeous reds like yours though. Isn't autumn just gorgeous Joan. 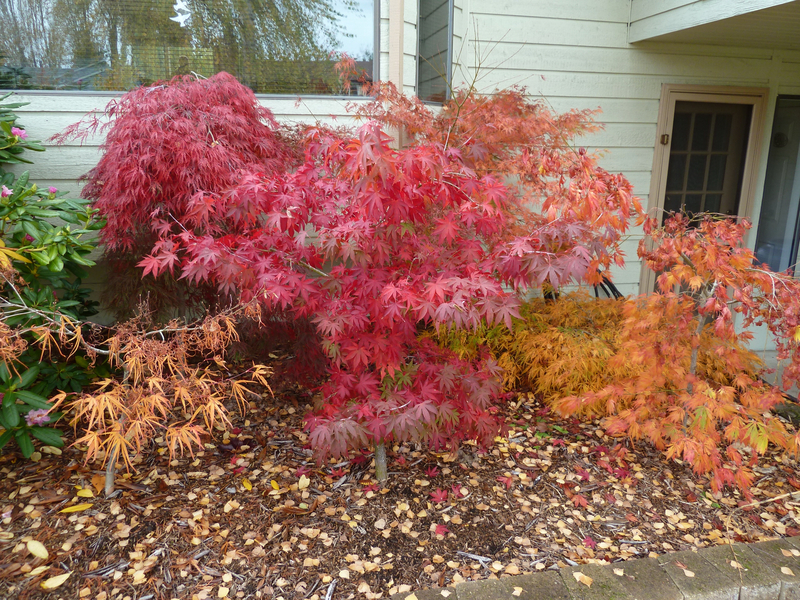 Japanese maples are one of my favorite trees! I have three but I would love more. Yours are beautiful. Thank you Jenny. I love them too.